3) Lookout for scaredy cats. 1) Don’t be too flashy. Try to use natural light whenever possible. A camera’s flash burst will often scare animals and create unwanted red-eye. Nothing calms an anxious pup like something to chew on. There’s no shame in using a treat to get your subject to sit still for moment. When using a squeaky toy, hold it behind the camera to make sure your pooch is looking in the right direction. ​Many animals, especially cats, startle easily so try and be quiet. Non-verbal communication often works better than shouting commands to get your subject to engage with the camera. Don’t be afraid to get down on all fours and be eye-level with the animal your photographing. It will make them more comfortable and it is easier to focus on their face and facial expressions from their level. Animals work on their own schedule. So, be prepared to follow them around until they are comfortable enough to act naturally around you and the camera. ​Photographing pets at play is a great way to capture their unique personalities. If a dog enjoys playing on the beach, snap some photos in the sand. Does your cat love chasing bugs in the garden? Take it outside to capture her in her element. Once you’ve taken an amazing pet photo, what’s the best way to display it? Have no fear, CG Pro Prints is here. Our online professional photo lab has everything you need to print vibrant, high-quality images of animals on canvas, metal, leather or photo paper. CG Pro Prints canvas gallery wraps are head and tails above the competition at a fraction of the cost. We use eight-color ink jet printing to retain as much detail as possible. CG Pro specializes in artist-grade canvas that is OBA-free, meaning colors won’t fade over time. They feature a durable, solid-faced front that won’t warp or sag. CG Pros canvas prints come framed or unframed and, best of all, ship ready to hang. Have more than one furry friend to show off? Check out CG Pros canvas collage options for more unique ways to display the whole herd. Not only are CG Pro Prints canvases well-made and affordable, they arrive quickly too. What’s the point of taking a great photo of a proud pooch if you have to wait weeks to put it on the wall? Our expert craftsmen use their cat-like reflexes to make sure your photo canvas is built and shipped in just three business days. Just like some people prefer dogs over cats, maybe canvas isn’t your thing. No worries, CG Pro has other ways to elegantly show off your animal photography. Our high gloss Metal Prints are printed on high definition, sublimatable aluminum sheets that create unmatched vibrancy of color. CG Pro Prints exclusive Leather Wraps provide a unique texture and richness unlike anything else in the industry. We use eco-friendly, cowhide leather from Spain to create a product whose depth and beauty must be seen to be believed. 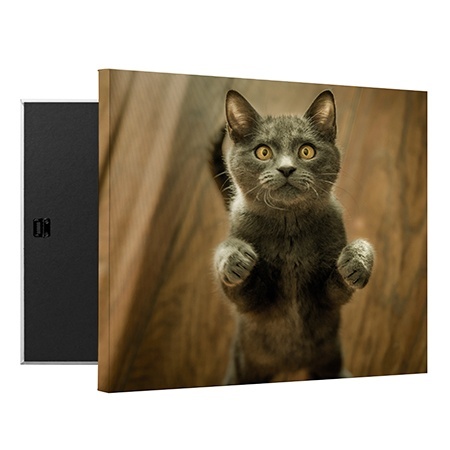 When it comes to unique and innovative ways to display your animal photos, CG Pro Prints is the cat’s pajamas. Our prices and quality can’t be beat and with three day shipping, you can spend more time with your pets and less time waiting.